The officers and members of the Cofradia with Bishop Luis Antonio G. Tagle, Bishop of the Diocese of Imus. 1. The Cofradia will give glory to our Lord God, Jesus Christ by being closer to Him thru His Mother, Mary; That thru Mary, we may fittingly honor our Lord with the promotion and propagation of the devotion to Nuestra Senora de la Soledad de Porta Vaga. Annual Cofradia Pilgrimage as part of the group's Lenten celebration. Badoc, Ilocos Norte. April 2011. 2. As Nuestra Señora de la Soledad de Porta Vaga is depicted in a contemplative and meditative mood during the evening of that first Good Friday, so too should the Cofradia spur its membership to strive to become more prayerful in their daily lives in order to foster development of a personal spirituality and prayer life in the devotees of Nuestra Senora de la Soledad de Porta Vaga. Annual Cofradia Lenten Prayer gathering and "Pabasa". February 2010. Mass and Prayer time during the Annual Cofradia Outreach Project. Pasay city. December 2010. 3. Like our Blessed Virgin represented by our Patroness in Solitude and Solicitude, the Cofradia will reach out to that segments of our Society who are alone, abandoned, dejected and rejected in order that they may develop civic consciousness, responsibility and discipline among its members, thus fostering their total personal and spiritual growth with the realization that the Catholic faith calls them to work for justice and to defend human dignity. Cofradia Outreach Project at the Home-for-the-Aged, Pasay city. December 2010. 4. 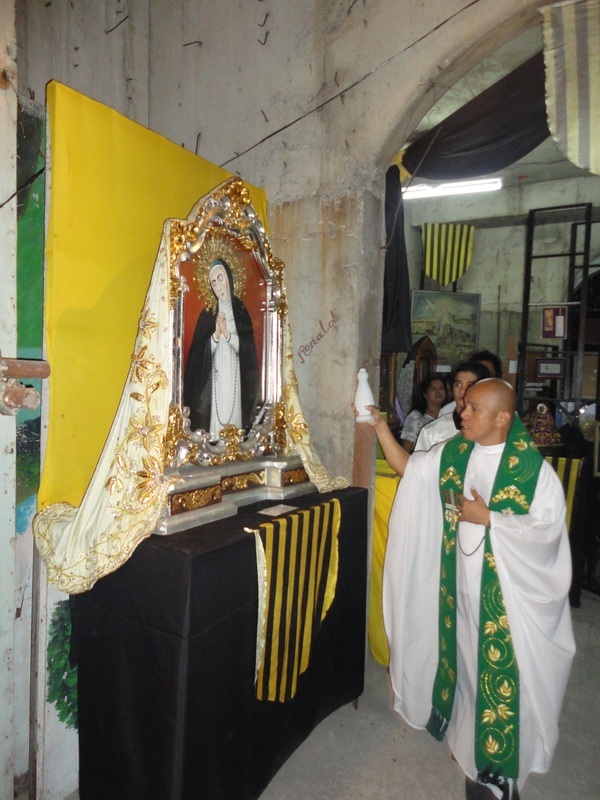 To upgrade the quality and standard of the devotion to Nuestra Señora de la Soledad de Porta Vaga. The Cofradia collaborates with many other expressions of devotion to Nuestra Señora de la Soledad de Porta Vaga, manifested in various ways approved by the Church. KARAKOL 2011. The Virgen's andas is one of the annual apostolates of the Cofradia. Members of the Cofradia accompanying the Virgen de la Soledad in Her 2nd Fiesta Grand procession. November 2010. Photo courtesy of Jayson Santos- Bacoor. Exhibit of different Virgen de la Soledad Icons and Images. November 2010. 5. 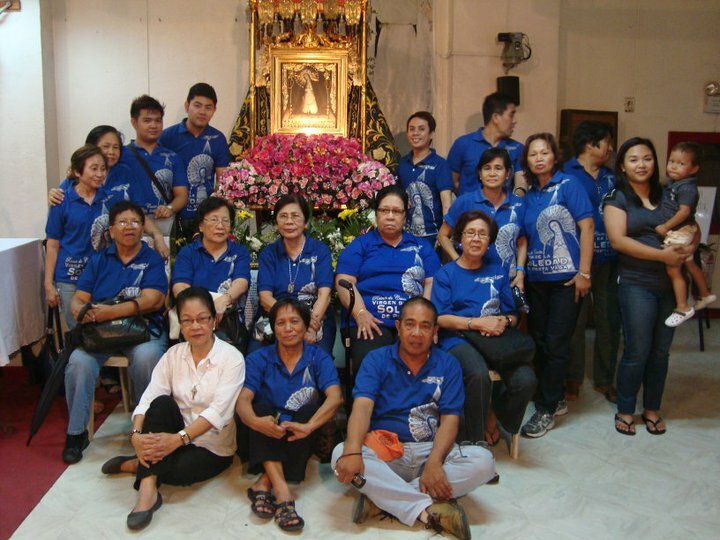 Through the acceptance of donations in cash or in kind, and by soliciting and raising funds, the Cofradia aims to utilize, enhance and nurture the talents, capabilities and resources of the devotees of Nuestra Señora de la Soledad de Porta Vaga in order to sustain, support and promote their devotion to Our Lady through its programs, projects and activities. 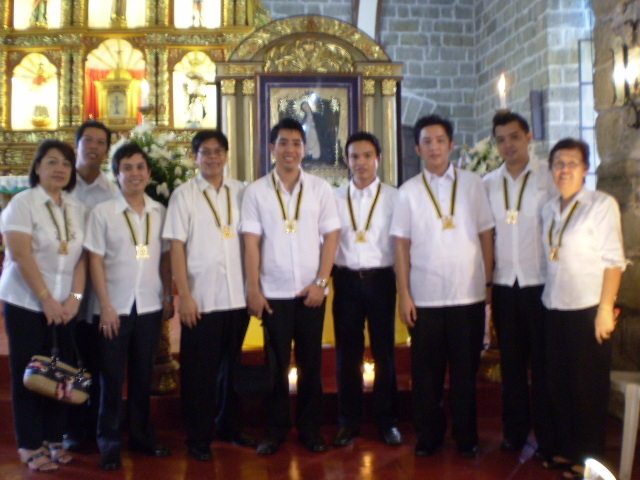 Officers and members of the Cofradia at the Chapel of Radyo Veritas. August 2011. The Carozza of the Virgen de la Soledad during the Opening of the Golden Jubilee of the Diocese of Imus. November 2011. 6. 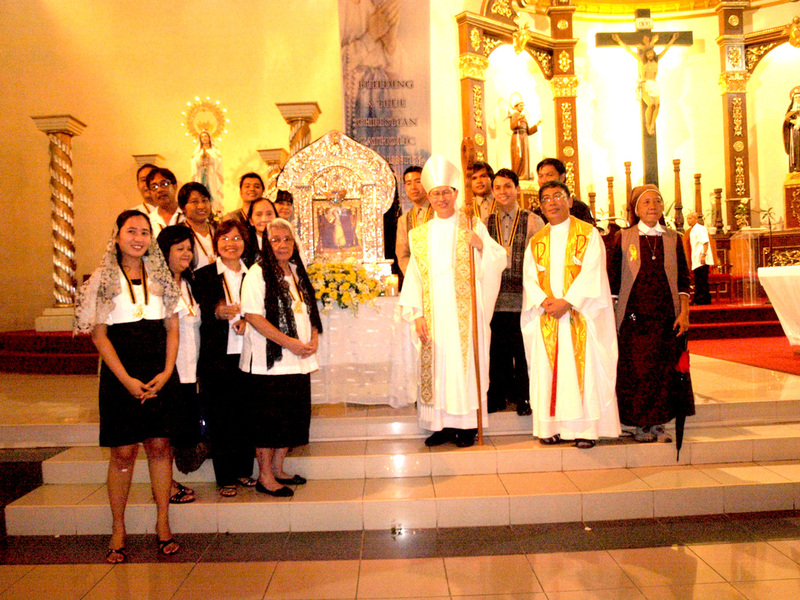 To serve as an instrument for the exposure of the devotees of Nuestra Señora de la Soledad de Porta Vaga in the actual practice of Church Service, drawing them to responsible participation in the life, mission, and work of the Catholic Community most especially in assisting in the needs of the Shrine of Nuestra Señora de la Soledad de Porta Vaga in Cavite City and promoting the authentic teaching of the Catholic Church and the strict adherence to the tenets of the Gospel. 7. To promote fellowship among the devotees of Nuestra Señora de la Soledad de Porta Vaga and acquaint its members with the nature of the activities of the Cofradia in order to foster loyalty and generosity among its members. 30th Anniversary of the Canonical Coronation, Nov.17, 2008. ---Renew these promises often, especially in moments of temptation, offering them in union with all members of the Confraternity and all devotees of the Virgen de la Soledad. 9. Accomplish the devotion to the Most Sorrowful Virgin by praying constantly the Rosary of Our Lady of Sorrows and meditating on Her Seven Sorrows as often as possible and offer such for the intentions of the members and the whole organization as well. Feast of Our Lady of Sorrows, September 16, 2007. First Saturday Mass, August 2010. Intramuros Grand Marian Procession. December 2009. 10. To guide the devotees of Nuestra Señora de la Soledad de Porta Vaga in the call to holiness by developing their personal relationship with Jesus Christ through the intercession of the Blessed Mother, based on the Scriptures, and the teachings of the Catholic Church, by holding conferences, round table discussions and seminars for such purpose. Cofradia Constitutional Convention. November 2009. 11. To nurture and impart in the devotees of Nuestra Señora de la Soledad de Porta Vaga positive, Catholic values and an understanding of the need for an active participation in the sacramental life of the Church, especially the Eucharist through the monthly celebration of the Holy Eucharist and novena in honor of Nuestra Señora de la Soledad de Porta Vaga every First Saturday of the month. 12. To educate the devotees of Nuestra Señora de la Soledad de Porta Vaga to become healers and reconcilers when conflicts arise, to pursue peace, and to become peaceful persons. Intramuros Grand Marian Procession. December 2008. 13. To help the devotees of Nuestra Señora de la Soledad de Porta Vaga recognize the movement of the Holy Spirit in their lives and discern their particular Christian vocation in the world - in the workplace, in marriage or single life, or in the priesthood or consecrated life. 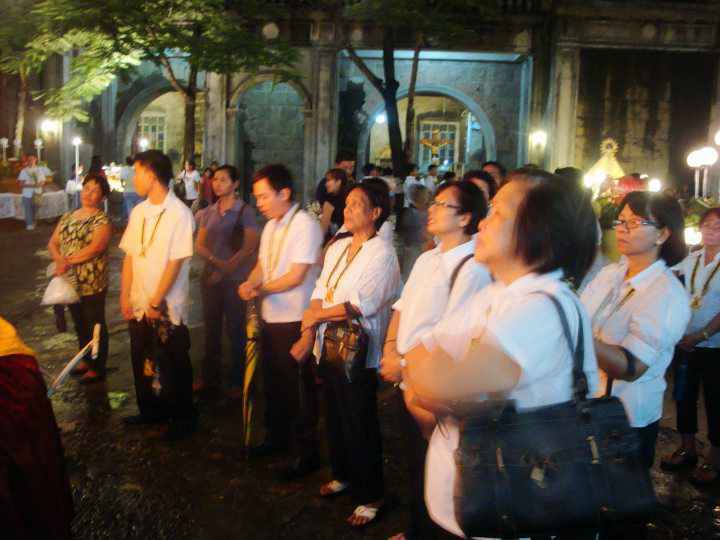 Intramuros Grand Marian Procession 2009. First Saturday Assemby, February 2011.